You are currently browsing the archives for the Totalitarian Left category. As with most central planning projects, the people directly affected by the project aren’t taken into consideration. That’s certainly the case with Blaine’s rejected solar energy proposal. As with most projects, this was a power play built on the premises that central planners know best and that the uppity peasants should just listen. Nowhere is it written that the neighborhood’s wishes were taken into consideration. Nowhere did the central planners think that renewable energy wasn’t a high priority of the neighborhood. That’s what happens within a bubble. Homeowners determined there’d never been a big solar farm placed so close to a residential neighborhood anywhere in the country. When residents spot checked zoning regulations in other jurisdictions, they learned that none of the nine cities and three counties allowed big solar farms near residential neighborhoods like theirs. 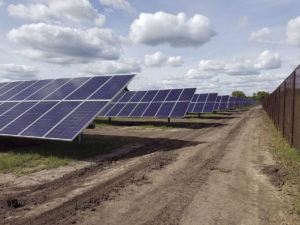 Days before city officials were set to amend the city code to allow solar farms in Blaine in late December, residents finally got through to City Councilor Julie Jeppson. Nothing in those statements indicates that she’s listened to the people. It was inevitable that enviroterrorists were bound to shut down the Enbridge Pipeline hearings. It finally happened when DFL-supporting protesters shut down the Duluth hearing. There’s already a pipeline there. I read tons of articles each day. Until a couple years ago, I’d never heard of Enbridge. If they’ve been irresponsible, I would’ve heard about it. These enviroterrorists would’ve highlighted the company’s safety record. The PUC would’ve rejected the project immediately. It isn’t surprising that Democrats’ criticisms of Lewis are dishonest. That isn’t just what Democrats do. It’s who they are. Saying that any Republican has “voted to let pollution clog our lakes and rivers” is over the top in the extreme. But my neighbors saw 20, 25 people, nobody knows the real count, outside. Their daughters were home alone, got scared, called their dad. He called the police, which, by the way, in the suburb I live in, it’s a violation of a city ordinance to what, not to mention trespassing. TakeAction Minnesota activists aren’t civic-minded people who want to start a dialogue. They’re hard-core activists who want to create a spectacle. As we’ve seen in the past, if they have to frighten people and trespass to make their point, they won’t hesitate in doing that. Sen. Schumer’s stupidity and tone-deafness will keep him as the Senate Minority Leader until 2022 and possibly longer. He has only himself to blame for that. By not confirming President Trump’s national security team the first day in office, Democrats are signaling that their resistance, aka their political stunt, takes precedence over national security. That’s a disgusting signal to send. It’s one thing to not confirm Rex Tillerson immediately. There were legitimate questions about him. 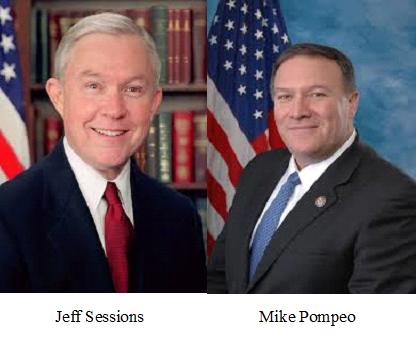 It’s quite another to not confirm Jeff Sessions as AG or Mike Pompeo as the director of the CIA. There weren’t any questions about whether Mssrs. Sessions and Pompeo were qualified. Michelle Goldberg of Slate Magazine insists that “The Trump Resistance will be led by angry women.” That’s possible, though I’m a bit skeptical of that prediction. Right now, it’s being run by idiots like Chuck Schumer, Keith Ellison and Hollywood ‘stars’ like Madonna and Ashley Judd. To Sen. Schumer: Enough with the shenanigans. Start putting America first for a change. Hillary Clinton threw a hissy fit during the final presidential debate when Donald Trump refused “to say whether he’d accept the election results.” That was Trump’s response to a hypothetical question. What Lessig is doing is implementing a plan to knowingly break the law. More importantly, if successful, it would thwart the will of the people. When George W. Bush defeated Al Gore, Democrats attempted to persuade some Republican electors to vote for then-Vice President Gore. This time, they’re doing the same thing. I don’t doubt that the DNC and the Clinton campaign will deny any involvement in this attempted theft of the election. If the DNC and the Clinton campaign deny participating in this evil scheme, ignore their statements. Thanks to Wikileaks, we know that the DNC rigged the Democratic primary so that Hillary Clinton would win. Further, we know that Donna Brazile, the current acting chair of the DNC, emailed specific CNN debate questions to Hillary Clinton and that the Clinton campaign was totally happy to skirt the rules. The point is that Mrs. Clinton isn’t an honest person. She’s publicly implied that thwarting the will of the people was anarchy. Connecting the dots, people have a right to question if this is one of those times when Mrs. Clinton’s private policy is significantly different than her public position. After passing a budget and repealing and replacing Obamacare, Congress should pass a federal law that prohibits electors from voting for anyone other than the winner of that state’s presidential election. It’s time we eliminated this electoral chaos once and for all.